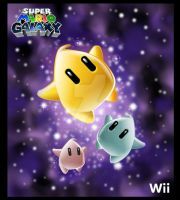 A small animated gif of a Luma from Super Mario Galaxy. This is too amazing for my burned eyes. <3 I love Lumaaaas! I regret to inform you that this has been stolen by another user. He's so cute ! I love so much that! Hey! It's me again^^ Um, I just wanted to ask where it is I would credit you for letting me use your luma as my webcam image. I would credit you in the "Custom" widget, but that's for premium members only. Would you mind if I used this as my webcam image? So pudgy and soft and cute and i want one!!! Awwwwwm me also!! xD Long Life for Lumas!!! awesome!!! sooooo adorable!!! cn i use it as my pic please??!! Also, absolutely adorable! 'Ey 3 a's. ummm... is it ok if i create my own?? is it ok if it is a different color?? Ok. Sorry I will do something else. Ooooops. Im sorry! i found this icon and did not realize i was not allowed.. im soory, ould u like me to delete it?? Man! This is so good it should be put in a museum!